The Barn Bag® Broodmare and Growing Horse Pelleted Feed Concentrate is a source of required basic daily nutrients for all broodmares and growing horses. Vitamins, minerals, amino acids, fatty acids and other nutrients required for pregnancy, lactation, and young horse growth are supplied in the correct amounts by the Barn Bag® Broodmare and Growing Horse Pelleted Feed Concentrate without the problems often associated with poor quality diets and/or over-supplementation. 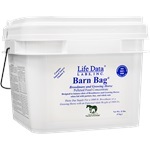 The formulation and nutrient content of the Barn Bag® is derived from research done at the Life Data Labs Research Facility with additional reference to the nationally recognized NRC Nutrient Requirements of Horses.